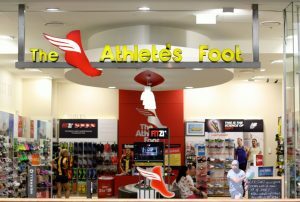 Several weeks ago, I was presented with the opportunity to visit The Athlete’s Foot where I would be fitted for a new pair of Mizuno running shoes. I am very familiar with the Japanese brand, having worn Mizuno court shoes throughout my volleyball years. They also sponsor many Canadian sports programs, particularly Team Canada Baseball. So, I was surprised to find that Mizuno is relatively new to the Australian market, despite the fact that they are one of the oldest sporting brands in the world (dating back to 1906; in comparison, Nike only dates back to the early 70s). Australians are fairly educated about their athletic footwear and podiatry is leading edge in this country, so I was thrilled to sit down to have a comprehensive foot assessment by a few of The Athlete’s Foot staff (including a podiatrist) and have a chat with one of the Mizuno reps, Shane, who gave me a wonderful overview of the company and their philosophy. It was by far the most detailed assessment I’d ever experienced in all my years of being fitted for athletic footwear! Fitzi is a system exclusive to The Athlete’s Foot, which shows customers where foot problems may exist, and why a particular shoe would be best for them. 1. I supinate a bit (foot rolls outwards). It is more pronounced when I am walking, though. and 2. My left foot is slightly larger than the other. Who knew? I’ve also been wearing a 1/2 size shoe too small for my foot, but I think I already was aware of this. I’ve always liked my shoes a bit on the snug side, but this is probably not a good thing and I definitely wasn’t getting away with it with these guys! Before helping me select a shoe, they also inquired about the type of athletic activity I do. This is actually a very important question which should never be overlooked by a salesperson attempting to sell you a shoe. For example, “running” simply doesn’t cut it. What kind of running? Are you a treadmill runner? 5-10km runner? Marathon trainer? Agility and sprint workout fanatic? The answer to this question will help in determining the right shoe for your foot. Okay. Time for my shoe selection! Have you heard of the whole “barefoot running craze” over the past decade? The premise of the shoe-less phenomenon is due to the fact that the foot is able to move more freely, thus leading to fewer foot issues. A shoe with “zero pitch” (height from heel to toe) is essentially meant to aid in strengthening the foot. Now, as interesting as this sounds, I’m not about to throw out my runners and start doing shoe-less treadmill intervals. Actually, to transition from a higher pitch to nothing can lead to achilles injuries. This happened to me once year when I transitioned from offseason training shoes with a fairly high pitch back into my soccer cleats! It was awful! Anyway, since I supinate, I was advised not to go for a shoe with too much support. Luckily, Mizuno has a “just enough” philosophy when it comes to their running shoes. They’ve simplified the structure of their shoes to have just the required amount of structure. Their new U4iC (“euphoric”) sole on all new 2014 shoes is also 30% lighter than past models. 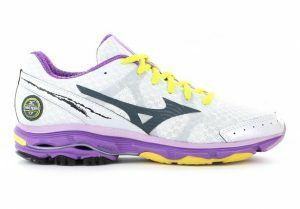 Also, they have created something called a wave plate in the sole, instead of thick dual density cushioning, which actually provides both cushioning and stability, thus reducing the shoe weight by 50g. 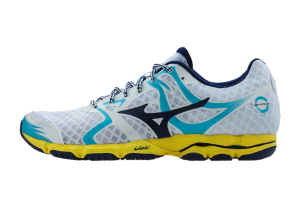 This is also something which makes Mizunos a great option for those who wear orthodics! I was presented with a few shoe options that were thought to be great choices for my feet, and I seriously couldn’t even believe how lightweight they were! How would I choose? I had narrowed it down to the Wave Rider 17 or the Wave Hitogami. 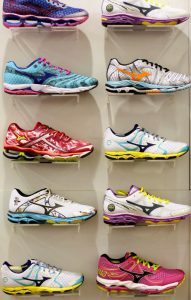 In my conversations with the sales personnel at The Athlete’s Foot, I found that one of the biggest mistakes consumers make when purchasing shoes is doing so based upon aesthetic principle. This isn’t surprising. I’m pretty sure I’ve done this in the past as well. I mean, most people want a shoe that is functional, but that they also like the overall “look”. I wasn’t really faced with this dilemma choosing between these two shoes, though. I find the Mizuno’s new range of runners are all quite aesthetically pleasing, and there’s something for everyone. Some of the women’s running selection. I think my favourite of the two was the Wave Rider 17. They felt best on my foot, as they are at a slightly higher pitch (which is a personal preference). However, they also have a very similar feel to the running shoes that I already have at home, so I thought I would give the Hitogamis a shot, simply for a slightly different experience. Honestly, I’ve been loving them! I waited for about a month to write this blog post, as I wanted to be certain that I’d given them a fair chance and used them in a variety of athletic situations. Personally, I like a shoe with a bit more pitch, so if I was to go back and purchase these shoes, I think I would go with the Wave Rider 17. However, the lightweight feel of the Hitogamis is like nothing I’ve experienced in a running shoe before. 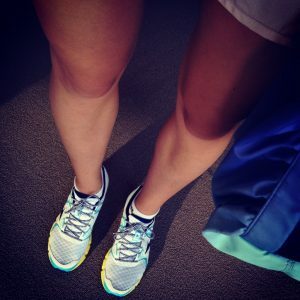 You barely feel like you are wearing shoes, although still have a ton of support during cardio and plyometric exercises. Buy from an experienced and knowledgable salesperson. Focus in on the specific activities for which the shoes are required. Understand the biomechanics and specific requirements for your feet. Don’t choose a shoe solely based upon aesthetic principle. 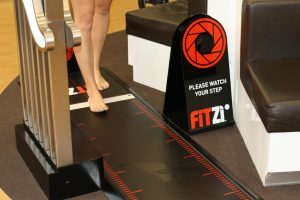 I’m so grateful to have had this experience at The Athlete’s Foot and used their Fitzi system. It was all so comprehensive, and I know that I’ll never go into an athletic shoe purchase the same way again. I was also extremely impressed by the Mizuno brand, specifically their running line. Bonus points for being a family-run corporation; they are genuinely behind their products. Thanks again to Mizuno & The Athlete’s Foot. I’m loving my new shoes and still have my eye on those Wave Riders! Not sure what your feet need? 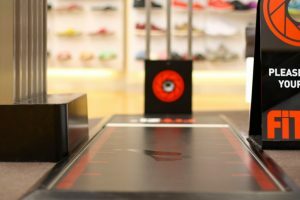 Check out Mizuno’s Precision Fit Shoe Finder, which I think it a great (and personal) way to figure out the right shoe for you before heading into the store or ordering anything online. 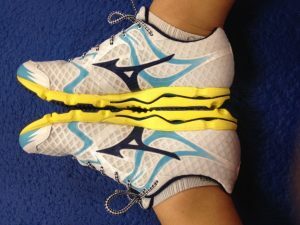 Although I received the Mizuno Wave Hitogami running shoes from The Athlete’s Foot for review purposes, I was not financially compensated for this post. The opinions and thoughts are completely my own based upon personal experience and preferences.